Want a classic roast-chicken flavor without hauling out all the heavy equipment? Here’s a very simple recipe for oven-roasted chicken that lets you brown the meat and roast it all in the same skillet, so there’s only one pot to clean afterwards. As well as being very convenient, if you use a cast-iron skillet for the job it also adds some additional iron to your meal, a nice bonus when you’re cooking poultry (which is typically lower in iron than red meat). It’s not only easy on the cook, either: this is one recipe that doesn’t sacrifice taste for convenience. With the classic flavors of garlic, lemon, and rosemary adding a sunny, Mediterranean taste to the dish, and a convenient side of roasted mushrooms made right in the same pan, it’s a family-friendly weeknight dinner that everyone is bound to love. If you want a second vegetable side for this meal, it’s easy enough to just toss some carrots or cauliflower onto a roasting pan and pop it in the oven before you start the chicken: your second side will be done at the same time as the main dish. If you’re looking to get a little fancier, this chicken would be delicious with roasted cauliflower soup, or maybe a fresh vegetable salad with black olives to keep with the Mediterranean theme. And like most other roast chicken, it’s also delicious cold the next day, so don’t throw out those leftovers! Keep them to slice on top of a salad; so you can enjoy the flavor twice and get double the reward from a quick, classic dinner. In a bowl, mix up the rosemary-garlic vinaigrette by combining the minced rosemary, garlic, olive oil, juice of 1 lemon, and seasoning with salt and pepper to taste. 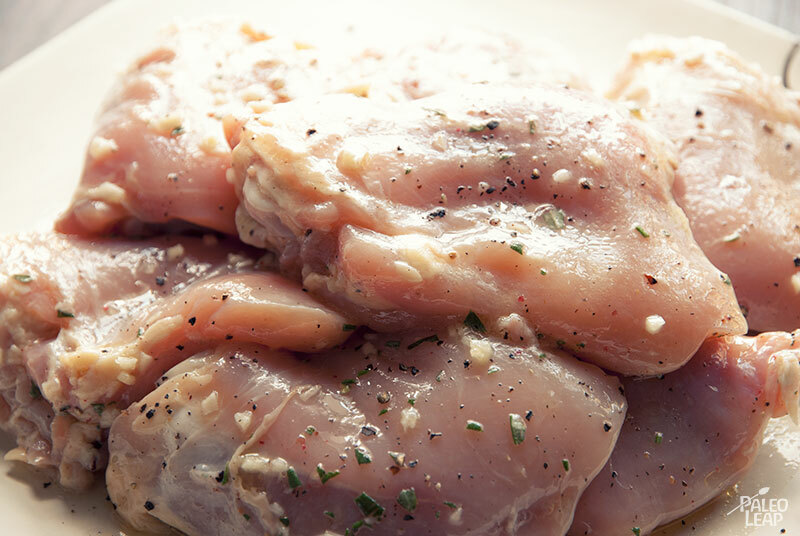 Coat each chicken piece with the vinaigrette. Heat an oven-safe skillet over a medium-high and sear the chicken, skin-side down, until browned, about 5 minutes. 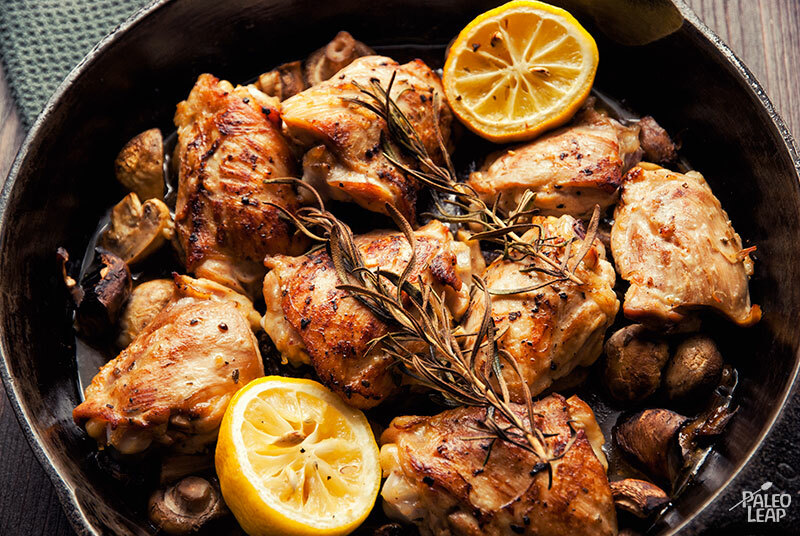 Remove the chicken from pan and add the mushrooms. Then return the chicken to the pan on top of the mushrooms and drizzle with the remaining vinaigrette and the juice from the other lemon. Add the rosemary sprig and the squeezed lemon halves to the skillet and place in the oven. Roast for 20 to 25 min.